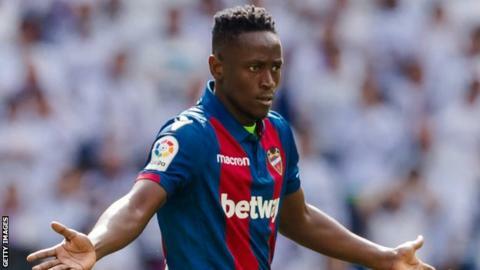 Emmanuel Boateng, 22, leaves La Liga side Levante after 18 months at the club. Ghana forward Emmanuel Boateng has joined Chinese Super League club Dalian Yifang from Spanish side Levante. The details of the 22-year-old's contract have not been disclosed. "Levante and Dalian Yifang have reached an agreement for the transfer of player Emmanuel Okyere Boateng," Levante said in a statement. "We would like to thank Emmanuel Boateng for his work and commitment during all this time and wish him luck in his new professional stage." In return, Boateng expressed his gratitude to the La Liga club, who he joined in 2017. "I want to thank God for how far he has brought me, and also many thanks to Levante UD for the excellent time we shared," he tweeted. "I will treasure all the great memories after working here with you as a team. Thanks to all the fans for their support and the love they've showed me." Boateng famously scored a hat-trick against Barcelona in a 5-4 home victory last season to break the unbeaten run of the Catalan giants. But he has struggled for form this season scoring just once in 16 La Liga appearances, including seven starts. He made a total of 50 appearances across La Liga and the Copa del Rey for Levante, netting eight goals in his one-and-half seasons with the Valencia-based club. Boateng moved to Europe in 2013 to join Portuguese side Rio Ave and was initially drafted into their youth system before making his first-team debut the following year. He left Rio Ave in 2015 to join another Portuguese top flight league side Moreirense where he spent three seasons before moving to Levante. Boateng played at the 2015 Fifa Under-20 World Cup in New Zealand and scored against Panama in the group stage to help Ghana reach the last 16 where they were eliminated by Mali. Last year, he broke into the senior side, scoring on his full international debut for Ghana in a 2-0 win over Japan in a friendly in Yokohama and has been a regular for the Black Stars since then.